Hisense offered the best bid of 12 euros ($14.2) per share subject to its acquisition of 50 percent plus one share of Gorenje in the takeover procedure, the Slovenian firm said in a statement on its official website. Hisense has committed to launch a takeover intent within 15 days and to make a takeover offer in accordance with the statutory deadlines, according to Gorenje. Gorenje said on Tuesday it received bids from three companies who had performed due diligence over the past several weeks, but it did not reveal the names of the bidding companies. The other two bidders were identified as the Chinese home appliance maker Haier Group and Hefei Meiling Co Ltd, according to reports by local newspapers Finance, Delo and Dnevnik. The three bidders declined to comment on the matter. Gorenje reported in March that its 2017 net profit fell 84 percent due to cost pressures and strong competition. It was seeking a strategic partner to increase cost efficiency and strengthen the brand. "Acquiring local companies is the easiest way for Chinese household appliances producers to expand their presences in the global market," said Zhang Yanbin, assistant director of All View Cloud, a Beijing consultancy specializing in home appliances, adding the European market is of great significance to Chinese appliance manufacturers. The Chinese home appliances market is almost saturated, so domestic makers are looking overseas to find new business growth points. The acquisition will allow the Chinese company to obtain local customers quickly and reduce production costs, Zhang said. 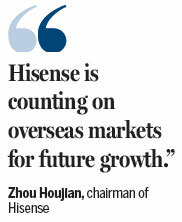 Hisense, which is based in Qingdao, Shandong province, has been relying on its go-global strategy to expand. "Hisense is counting on overseas markets for future growth," said Zhou Houjian, the company's chairman, in an earlier interview, adding it is targeting the middle and high-end segments of the market. The company has secured sponsorship deals for the 2018 FIFA World Cup, becoming the first-ever Chinese consumer electronics brand to sponsor the tournament.